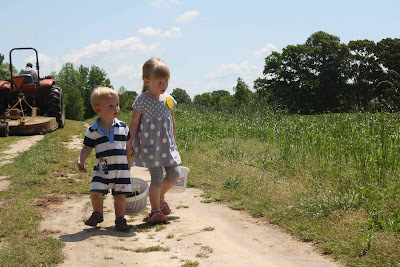 We have been meaning to take the kids to Jones' Orchard and pick something for at least a year. And then never remember to go when things are in season. A friend posted a picture on Facebook saying that the strawberries were in season and I was determined not to miss it. 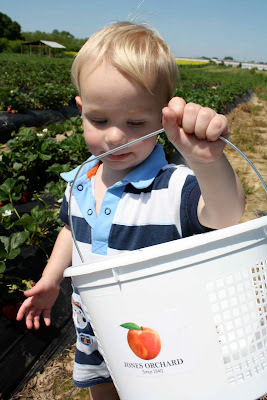 However, with as much rain as we've been having the weekends have been either too rainy or muddy to go as a family and with more rain in the forecast for this weekend I decided to ditch Daddy, sorry Chris!, and head out with the MOPS group to go pick strawberries. I knew Sarah would love it! She would eat nothing but strawberries each meal if she had the chance. She always wants to eat strawberry jam sandwiches and have cut up strawberries, and strawberry yogurt to go with it. I wasn't sure how Cody would like the trip to the patch but he was loving it! It was like an Easter egg hunt in a way for him. He knew he had to look and find RED strawberries. He caught on to that idea much faster than Sarah who I had to keep reminding not to pick the green ones. He would get excited when he would find a big red strawberry. He'd pluck it off and proudly show me before dropping it into his bucket. I honestly think I had more fun just watching him! 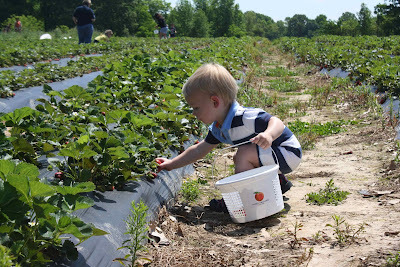 Cody finding the bright red strawberries to pick. Sarah and a friend from the play group looking for berries. Cody trying to show me what's in his bucket. Looking for more red berries. Near the end Cody put his finger through an over ripe one as he was trying to pull it off the vine. He then realized he could eat these things and I spent the rest of the time trying to get him to stop pulling them off the vines and eating them right away. And to keep him from pulling some out of other kid's buckets and eating them. He was one hot sticky mess. Sarah picked so many she insisted that her bucket was too heavy and needed me to carry it back for her. 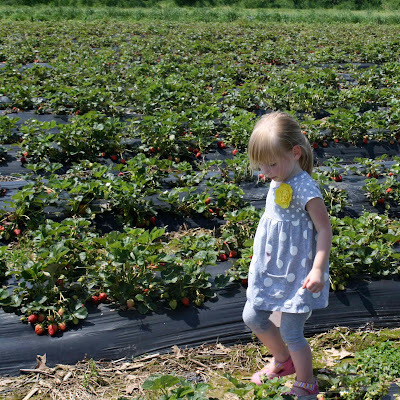 She's excited about all the things we're going to make with the berries. Well, she's mostly excited about the strawberry cake and strawberry pancakes we're going to make with them. They are getting so big and love each other so much! 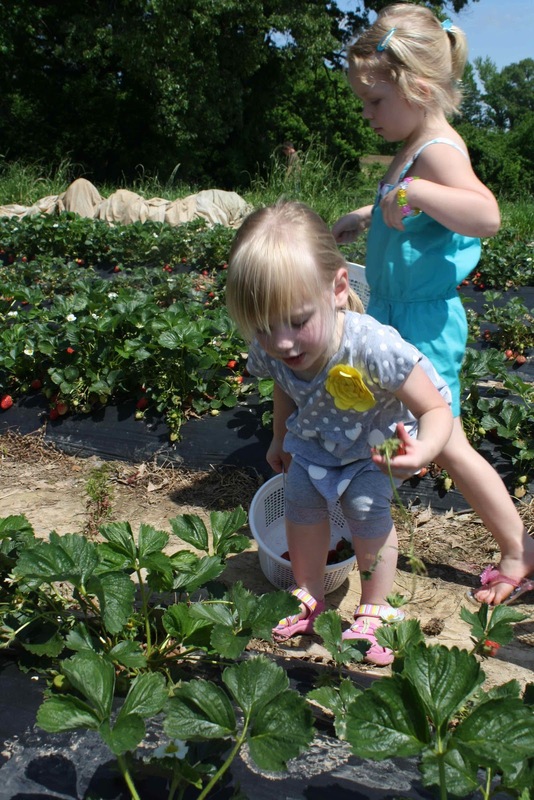 We had a good time picking strawberries. The next fruit to be in season is peaches and we promised Chris that we'd make time to go as a family to pick peaches. So I guess I need to start searching pinterest for peach recipes. Cute pictures! 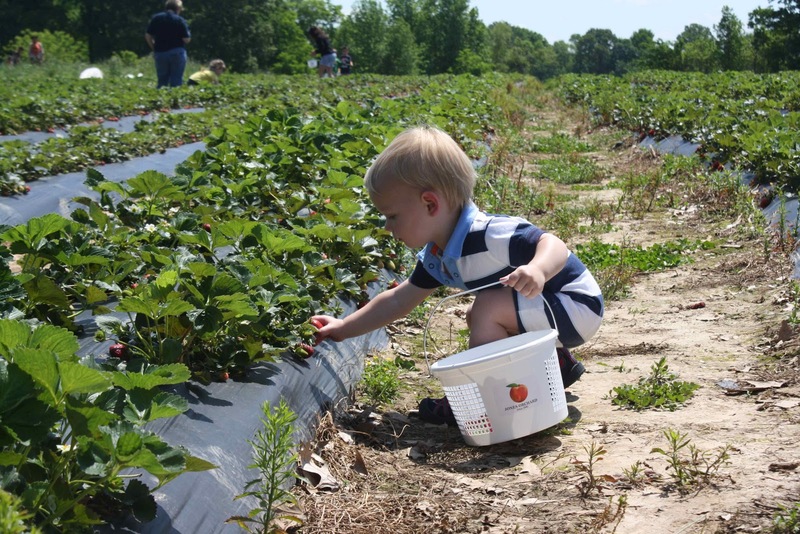 Strawberry picking is a great way to spend the day with the family. Kids love to eat the fruit that they picked themselves.